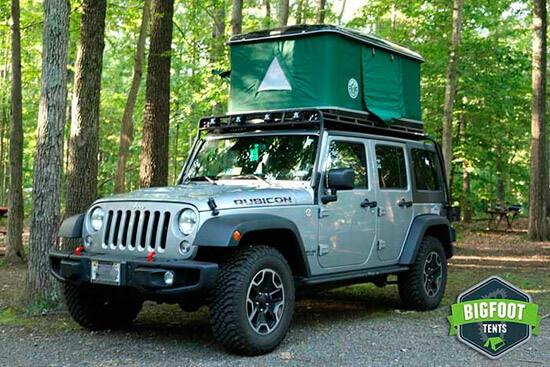 Bigfoot Roof Top Tents are the "Auto & Truck Camper's dream come true". Melding the best top quality materials and craftsmanship to bring you Roof Top Tent features that will support you in any car camping adventure you can dream up. Car or Truck Camping over last minute motels, Car Top Camping over cold sleepless windy nights. Auto Tents mean no more fumbling with tent poles in the dark, or tent blowouts as in a standard camping tent. Raccoons, scorpions, tarantulas or even mosquitoes won't cause you ill. 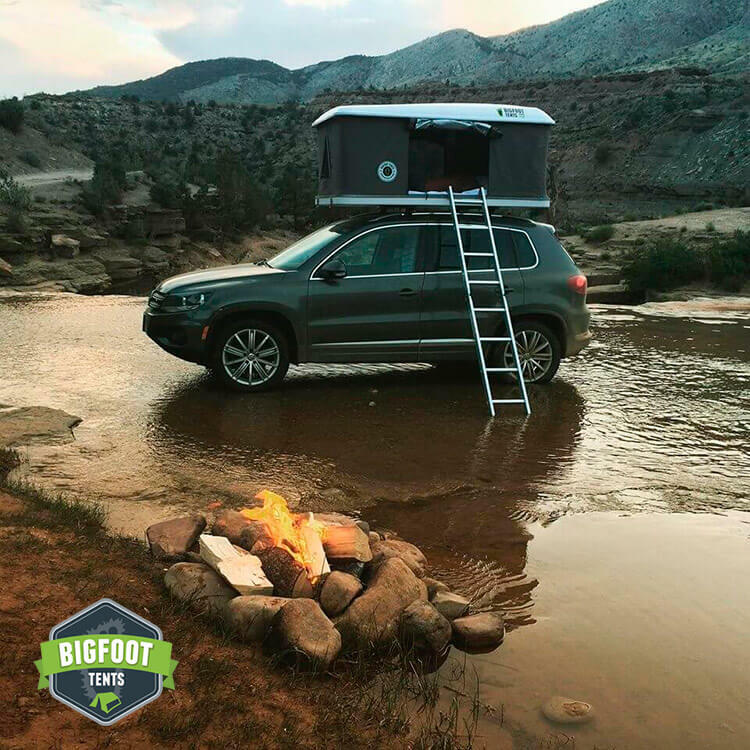 Simply put, Bigfoot Rooftop Tents give you more freedom to camp and more confidence in what you do no matter where you do it. Your camping experience will fare well with the comfort, convenience and protection of our New or Used RTT Bigfoot Roof Top Tents. "Designing, manufacturing, buying and selling Roof Top Tents." What style of Roof Top Tent should I get? As you ponder vehicular shelters examining the facets and qualities, you might want to start with realizing there are two types of Roof Top Tent. Soft top or "A" Frame Roof Top Tents and Hard Shell Roof Top Tents. Out of the two, the Hard Shell Roof Top Tent is considered the "premium" choice. The Hard Shell RTT's are quicker and more convenient to deploy. The HSRTT's are deemed to be much more aerodynamic and stylish. Why purchase a Roof Top Tent or Roof Rack tent from Bigfoot Roof Top Tents? This rooftop tent is not like other roof tents you may have used or even seen in the past. This updated car & truck roof top tent is made to fit almost any typical car or truck roof rack system like FACTORY Roof Racks, Thule or Yakima Roof Racks. Unlike some roof top tents, this unit is constructed to withstand almost 600 lbs. It's very difficult to keep them in stock from Orange County, California to New York, New York. Enjoy the freedom that this amazing Bigfoot Roof Top Tent offers. A Roof Top Tent installed on a Volkswagen S.U.V. - in Boulder, CO. There's something about a car, truck or Jeep camping with it's safety, security and convenience that has people everywhere talking about the auto camping experience. When you see so many new cars and trucks sporting these new types of vehicle shelters, it makes others stop and think about buying one of their own. The increased exposure must account for the explosion in online sales of these types of car camping roof rack accessories. It's refreshing when you see a new item that peaks your adventurous nature. Especially one that elevates an important item such as your car, truck or SUV to this extreme camper level. It's important to note that people tell us one of the main reasons they want to own a Roof Top Tent by Bigfoot Tents is the "Freedom" aspect of traveling. There are hundreds of FREE parking spaces in EVERY city in the U.S.A. The truth is when it comes to an R.T.T. (Roof Top Tent) you can park in any traditional automobile parking space. Use your imagination, and think of the most beautiful place you can within driving distance. Now drive there, open your RTT and stare out. When you take a break from reading a book in the breeze, cast your eyes onto whatever real estate you can muster. The forest, woods, wetlands, creeks, rivers, lakes, fields, parks, festivals, parades, dog parks, beaches, and nature reserves are all proper for a Rooftop Tent. A beautiful customized 4 Door Jeep rocking a Jeep Roof Top Tent - Washington D.C.
Kindly SHARE, LIKE and ADD us it helps out, be entered for a new 2019 Bigfoot Roof Top Tent!